Tonight is a sky watcher's dream starting right at dusk. WASHINGTON – Tonight is a sky watcher’s dream starting right at dusk. In the western sky after 9 p.m. look directly west from a location that has a good view free of trees and buildings. You will see a tight grouping of three fairly bright stars above the horizon. The uppermost star is really the planet Saturn, and to the lower right is the reddish, orange planet Mars. The star next to Mars is Spica. Mars has grabbed headlines this week because of the landing of Curiosity, the latest Mars Rover. Now you can see Curiosity’s new home with your own eyes. Go ahead, say hello and wish her well on her two-year expedition. See the latest on her mission here. NASA also has an ongoing mission on Saturn. Get more information on Cassini, “the solstice mission” by clicking here. While you are looking at the trio, consider this: The speed limit of the universe is the speed of light or 186,000 miles per second. We can say how far away an object is by how long it takes for its light (or radio waves) to travel to Earth. Mars is 14 light minutes from Earth (152 million miles), Saturn is 85 light minutes distant (910 million miles) and Spica is 250 light years (1,500 quadrillion miles – add 12 zeroes to this number to see it in full form!) away. This gives one an appreciation for the size of our solar system and how far away the stars are. By the way, the moon is 1.5 light seconds distant (240,000 miles average) and the sun is 9 minutes (93 million miles average). Next up for us tonight is the peak of the annual Perseid meteor shower. Each year at this time our planet encounters a debris stream of comet dust made by Comet Swift-Tuttle, a periodic comet with a 133-year orbit. As Earth moves in its orbit around the sun, it collides with this debris stream and the dust particles hit our atmosphere to become shooting or falling stars. Traveling at 134,000 miles per hour (36 miles per second), these bits hit the atmosphere 60 miles up and heat the atmosphere white hot, which is what we see. Usually the size of a grain of sand, they can also be as big as a pea or little larger. Speed plus size makes for a lot ogling while we watch the Perseids through the night. The best place to see the Perseids is a location that is away from lights and obstructions such as trees and buildings. If you are a city dweller, you still may see the brightest Perseids as long as you are not staring into a street light or nestled in amongst tall buildings. The view of the Perseids is worth it from the suburbs as long as lights and obstructions are minimized as best you can. Out in the country or along the beach – where people usually vacation this time of year – is the best place to be. You do not need any equipment to enjoy tonight’s show. Just find a place where you can put a lounge chair or blanket to see the sky. Starting at 11 p.m. in the northeastern constellation for which this meteor shower is named – Perseus – hangs low above the horizon and will rise higher as the night progresses. A meteor that is part of the shower can be traced back to Perseus. 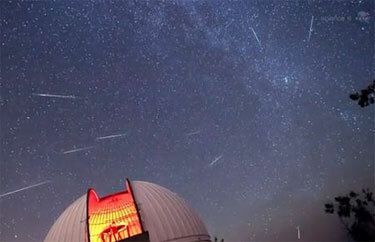 Sporadic meteors that are not part of the shower can be seen during the night, as well. The shower should improve after midnight and from a dark sky site as possibly one to two meteors per minute can be spotted in the sky. The key to watching the shower is being comfortable. The Perseids can appear anywhere in the sky, but looking straight up gives you the widest viewing area. This is where the lounge chair or blanket come in handy. Enjoy the shower with family, friends or your significant other. Food and beverages are an added plus. If you stay up all night, you will see the waning crescent moon rise in the east at about 2 a.m. with the planet Jupiter (42 light minutes or 477 million miles distant) just above it. At about 3 a.m., brilliant Venus (5.68 light minutes or 61 million miles distant) rises and adds to the sky show. Learn more about the shower here. If you really get into watching the shower, NASA has an app that lets you count the number of Perseids you see and report your results. See what’s in the sky this week.